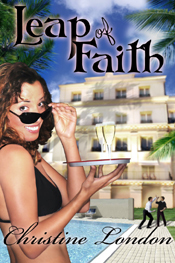 Leap of Faith: A love triangle runs aground when personal secrets are found out. Mistaken identities and a medical secret combine to heat up this run away trip to Italy. Mini-synopsis: Film student Faith Holmes is on an Italian holiday bought and paid for — a familial inducement to finding an Italian husband. She wants none of it. Boredom and curiosity make for a volatile mix and Faith is lured into the heart of the island of Forio’s exclusive international film festival not as guest, but crasher.Hollywood’s premiere publicist Hunter Jameson has more than enough on his plate when his client, English film sensation Alex Winslow decides he’s departing from the straight and narrow. One American party crasher should be the least of his worries. He has no idea that Alex’s growing feelings for Faith rival his own. The only thing for certain is his life will never be the same. Sign me up for Christine In Progress News & More!